← The Fessenden iLab is Open! Project learning linked to summer reading is a terrific way to hit the ground running when the new school year starts. As a summer reading assignment, 4th grade boys read their choice of a number of “Who Was” series biographies (among them: Rosa Parks, Barack Obama, Eleanor Roosevelt, Steve Jobs and others). In the first days of school, boys got a productive start by organizing the information they learned from their books and writing a biographical summary. In 4H and 4M boys began the process by completing a short reading survey (via a teacher-created Google form) about their book. Using the Google spreadsheet, compiled with their survey comments as digital notes, boys drafted, revised and finalized a summary on the life of their person, in first person perspective. Learning about perspective was a part of the writing assignment, as was a review of writing as a process with distinct steps in brainstorming, drafting, editing, and revising, before a final copy is complete. Once the final piece was ready, boys had a lesson on copyright and used recommended web sources to find and download a copyright-friendly image of their person for the project finale. The final step involved FaceTalker, an iPad app that puts your audio recording and a moving mouth on a still photo. Using this app, boys made their historical figure “speak” about themselves by reading their biographical summary. Listen to one here. The process of reading their writing aloud helped develop and practice important skills in reading fluency. Additionally, this audio examination of their writing frequently resulted in additional edits as boys really listened to what they had written and realized by hearing it aloud, there was a better way to frame the thought. Videos were saved to the camera roll and uploaded to DropBox to be shared with their peers. This was a thoroughly engaging way to get the boys right into writing, introduce them to fourth grade technologies and a proper forum to make summer reading relevant and enriching. 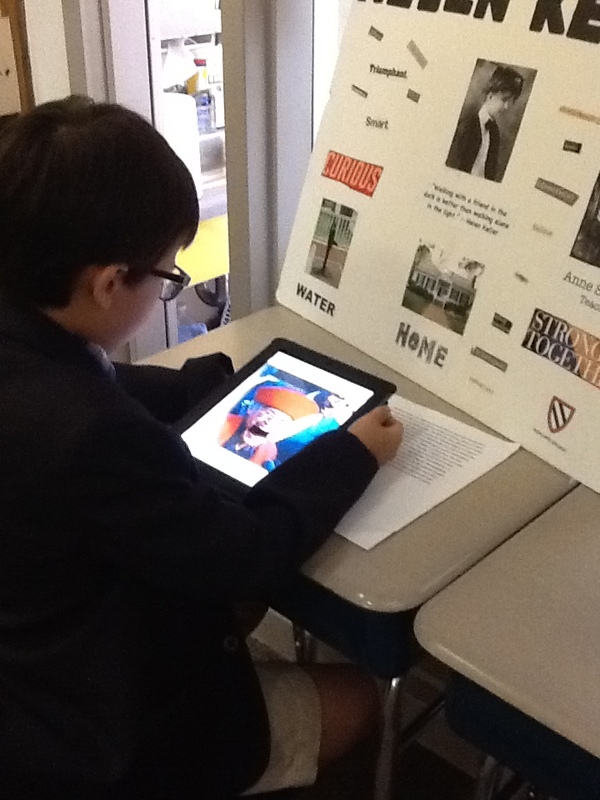 This entry was posted in Creativity, Featured App, Project Based Learning. Bookmark the permalink.